Election Results - 2009 Executive Board - Congratulations and thank you to the winners! JOANNA & LISA STEPPING DOWN AT THE END OF 2008 SEASON - After years of service to our team, Joanna Houghtelling (team president) & Lisa Johnson (team treasurer) are stepping down. Joanna & Lisa have devoted many years to the team and have decided to pass the torch at the end of the 2008 season. We do have a new team president lined up for the 2009 swim season (thank you Tammy Bollinger). Anyone interested in stepping forward to fill the position of team treasurer please contact Joanna (Joanna@southgatepenguins.org) or Lisa (Lisa@southgatepenguins.org) for more information. BIG NEWS!!! 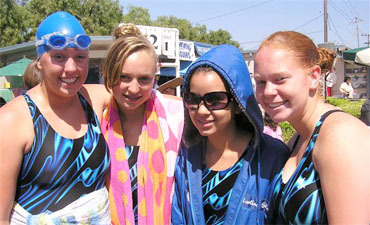 - TAMMY BOLLINGER has accepted the position of Team President for the 2009 swim season! THANK YOU TAMMY! Also, KATY WU has stepped forward to take over the Southgate Penguins website for 2009. THANK YOU KATY! EBSL CHAMPIONSHIP MEET RESULTS - The full EBSL Championship Meet results are available by special request. Results are available in PDF format for 1996 through 2008. Simply email me (Skip Wagner - Skip@southgatepenguins.org) your request and I'll send them to you. Please specify year(s). Past or present Southgate Swim Team members only! RECORD BOOK UPDATED FOR 2008 - The Southgate Swim Team Record Book is now available in electronic form. Our Record Book was started many years ago by former team member and subsequent team coach, Dennis Dougherty, and includes the top 10 individual event times and best relays for all ages dating back to 1968. Special thanks to Dennis for keeping this tradition alive! If you would like a copy of the Southgate Record Book in Acrobat Reader format (PDF), simply email Burt Leland (burt@southgatepenguins.org) with your request. Requests must be from past or current Southgate Swim Team members only. TEAM EMAIL LIST - Everyone please make sure you are on our team email list. This is probably the best way to keep abreast of late breaking news and important announcements. Please email Skip Wagner (Skip@southgatepenguins.org) to have your email address added to the list. POOL RENTAL - Contact Norma Guzman at Norma@southgateswimclub.org. For non-club members and club members. CLUB MEMBERSHIPS - Contact Lisa Johnson at Lisa@southgatepenguins.org. They have all joined the Native Sons of the Golden West. The Native Sons donated $2000.00 towards our new swim blocks and lane lines. Now is the time to thank them and join. To join, you just need to be a male and a native Californian. Contact Bob Houghtelling at 276-4970 or Walt Herpe at 887-6492 for more information. !! !--> Thanks to our Sponsors <--!! !